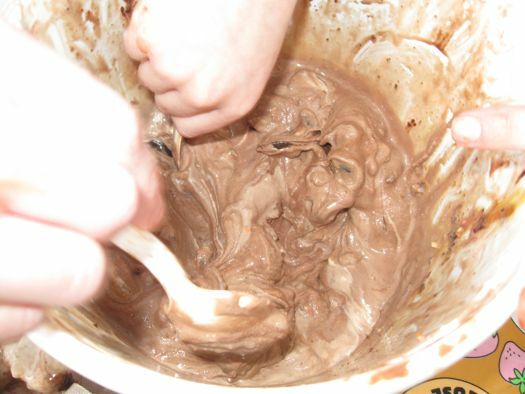 Because ice cream: Stewart's had a sale on half gallons of its ice cream last week. And this week Stewart's president Gary Dake tweeted it was a record sale for the company, with an average of 769 half gallons sold per shop. + $774,867.47 in half gallon ice cream sales. * Stewart's has 337 shops, according a January company press release. 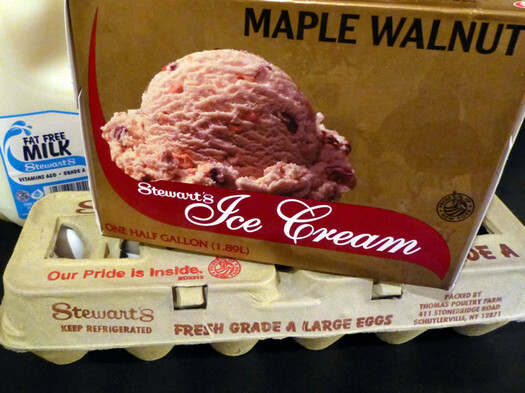 By the way, we stumbled across the remarkably thorough Stewart's FAQ page today, which covers everything from why there's not an ice cream club card, to the source of the company's eggs, to why the shops carry "adult sophisticate" magazines. 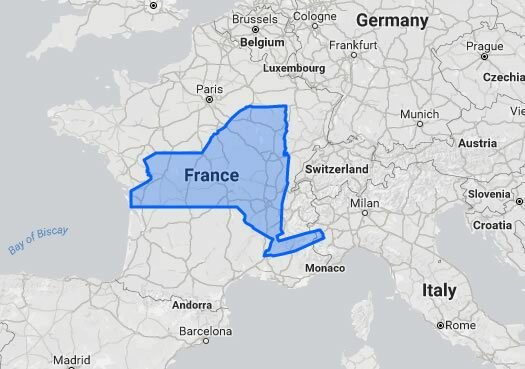 A little goofy, but what good is the internet if you can't superimpose the borders of states and countries onto other states and countries to get a sense of their relative sizes during an afternoon lull. A site called The True Size allows just that. 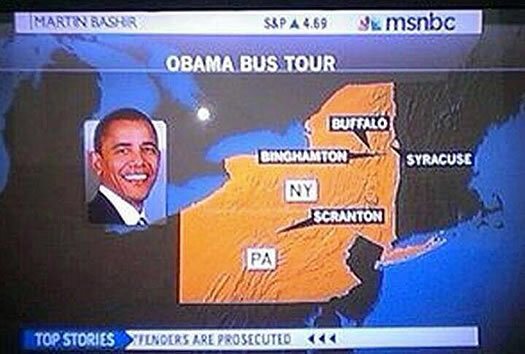 So, of course, we selected New York State and moved it around the world. See the screengrab above. By the way, one of the interesting things about that site is the way it highlights how map projections affect the size of countries. 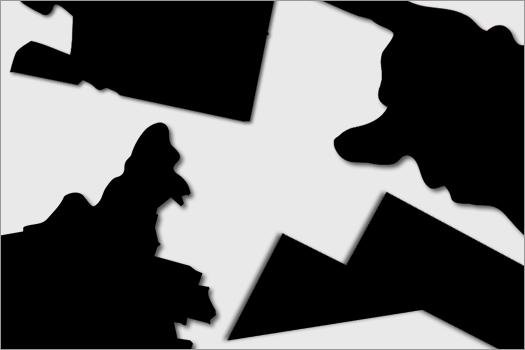 As you move New York State north and south around the world, its outline grows, shrinks, and warps. We can all agree that we live in uncertain times. 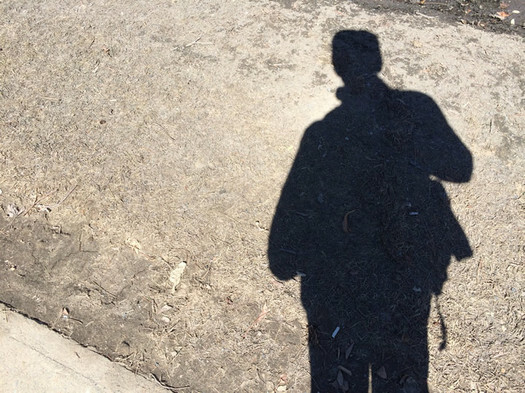 So much now is odd or nonsensical, a parade of the real fake and the fake real. 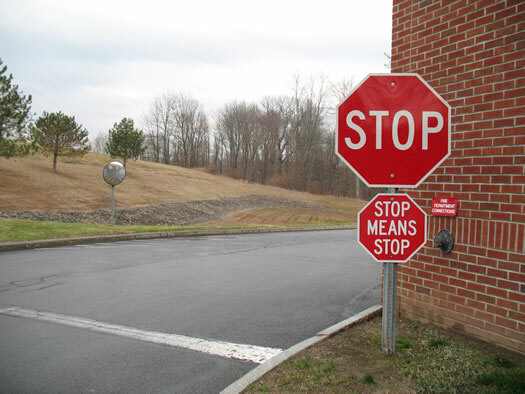 It's easy to feel like we're simultaneously doing too much and not enough. 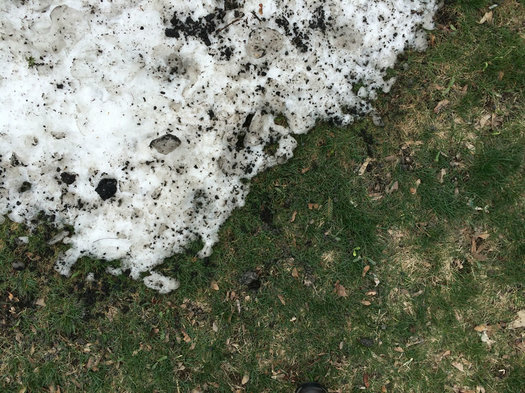 So let us be clear: That's enough, March, that's enough. Because Friday afternoon... another round of bumper gawking, which we haven't done in a long time. The dog's name: Finn McCool. 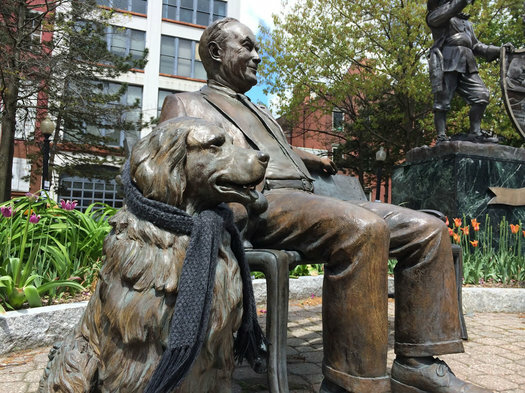 The statue dog that sits alongside the statue Thomas Whalen in Albany's Tricentennial Park has been wearing a scarf for some time now. It's been at least a few weeks. We hope he gets a change of wardrobe soon. The weather's finally warming up. 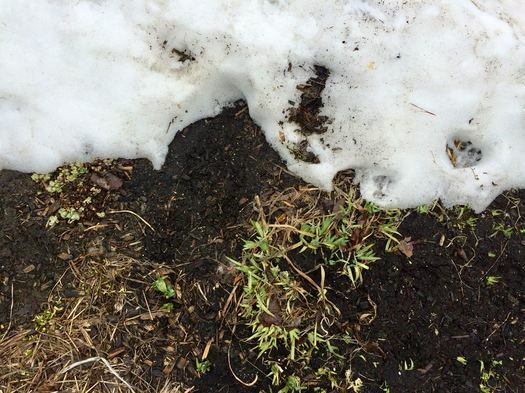 April is a good time to take stock of the past winter and assess how things went. Toward that end, we recently obtained a copy of this year's exit interview with winter. Because Friday afternoon... another round of bumper gawking. All this time and we didn't realize an economic opportunity was literally growing right in our backyard. 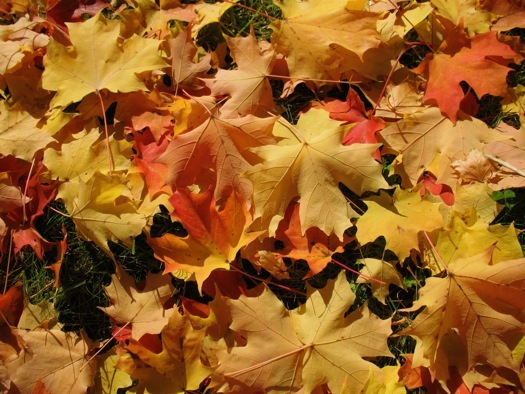 Our foliage experts hike all around the Northeast in search for the perfect leaves. During our collection phase we sift and filter through our inventory, hand selecting only "Grade A" foliage. All for $19.99. And of course, there's also a service for shipping snow. The Honeycrisp was the easy winner -- more than twice as many mentions as the Gala. 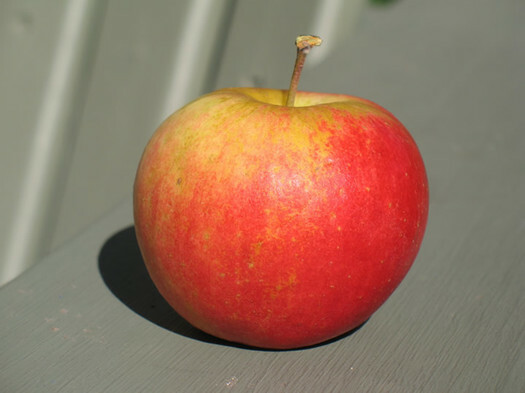 We've said this before, and we'll say it again: We believe the Honeycrisp to be overrated. 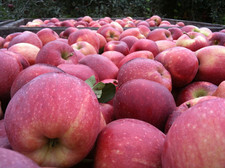 If you like Honeycrisp, try one one of the new Snapdragon apples. We were heartened to see the Empire near the top. 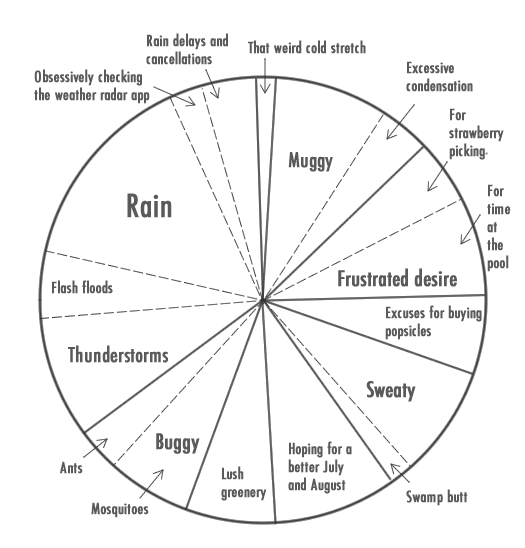 And Ashmead's Kernel even got a mention (one you should try at least once). We've gotta check out the Koru, which haven't had, yet. And there were even the obscure Fiona Apple and iMac mentioned. The whole list, with mention counts, is after the jump. Friday afternoon before what's a long weekend for a lot of people? 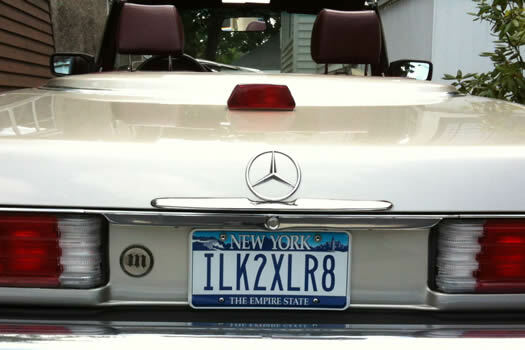 Sounds like time for that highest of high concepts... bumper gawking. 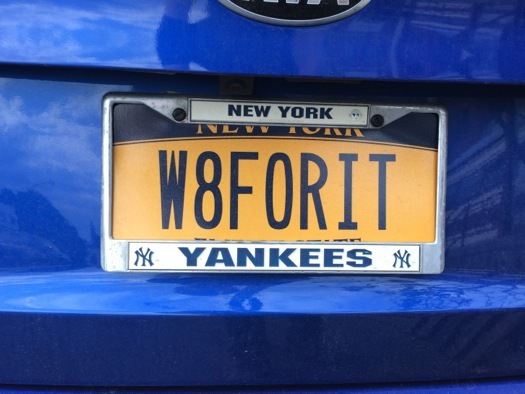 At long last -- it's been a while since the last collection of custom license plates. There are some fun ones this time around. Many decades from now your grandchildren will probably ask, "Grandma/grandpa, tell me about the early 21st century." To which you'll say, "It was an odd time. One of the greatest artificial intelligence/information companies in the world allowed us to turn maps of local places into an ancient game called Pac-Man." 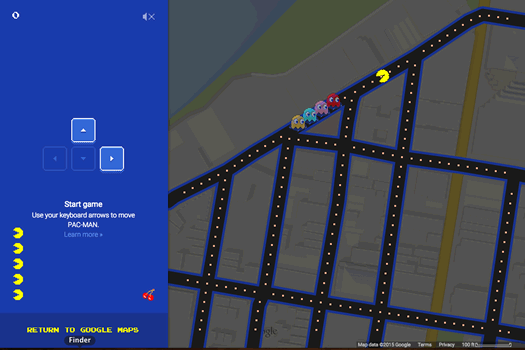 As you might have seen, Google's April 1 fun thing this year is a feature that allows you to use Google Maps to play local streets as a game of Pac-Man. It turns out downtown Troy (screenshot above) works pretty well. 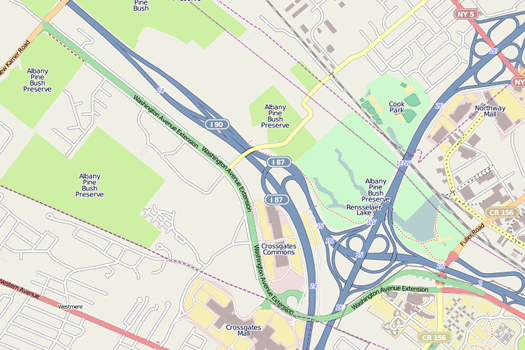 Added later: The one for the Union College area is fun. Everything just seems cold and gray now, and life shouldn't be like that. After thinking about this for a long time, we've decided it's time to break up. It was a hard decision to make. But we think this will be the best for everyone. New York City, so many brains, so little time. 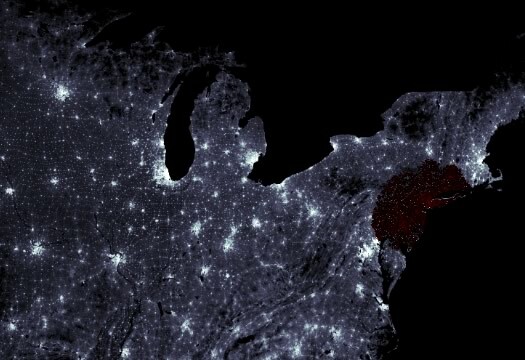 Update: Here's a link to an interactive map that research group posted that models how a zombie outbreak would theoretically spread. The map clip above shows the spread from an outbreak in New York City after 96 hours -- AKA, a good time to have already left the Capital Region. 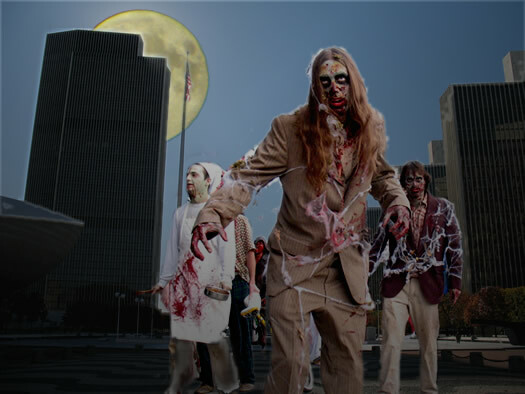 So, there's that: When the zombie apocalypse arrives New York City will probably fall in about a day, while upstate New York will have weeks to prepare for the undead assault. So conclude a group of Cornell researchers who have done statistical modeling of a zombie outbreak. In most films or books, "if there is a zombie outbreak, it is usually assumed to affect all areas at the same time, and some months after the outbreak you're left with small pockets of survivors," explains [Cornell grad student Alex] Alemi. "But in our attempt to model zombies somewhat realistically, it doesn't seem like this is how it would actually go down." "Given the dynamics of the disease, once the zombies invade more sparsely populated areas, the whole outbreak slows down--there are fewer humans to bite, so you start creating zombies at a slower rate," he elaborates. "I'd love to see a fictional account where most of New York City falls in a day, but upstate New York has a month or so to prepare." Maybe the Regional Economic Development Councils can work zombie-prevention projects into the next round funding pitches. 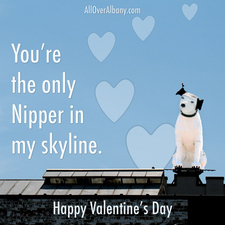 Also, new slogan: "Upstate New York, Fewer Humans to Bite!" See, any negative can be in turned into a positive. Update: Congrats to Kelly for being first with the correct answers (we're applying Jeopardy rules to the name) after just 56 minutes. An un-cropped photo is now after the jump. And a tip of the cap to Duncan and Paula for also getting the correct answer. Upon which street do the eyes in the above photo gaze? To whom do the eyes belong? * And from which building do they look? Be sure to include a working email address (that you check regularly) when submitting your comment. 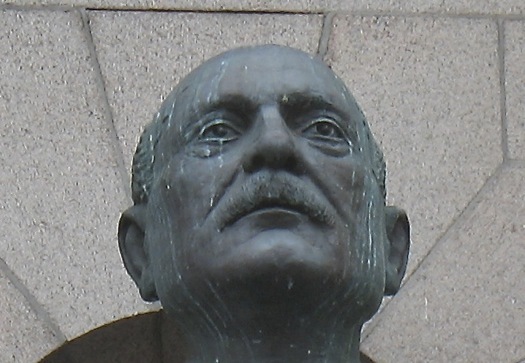 * That is, who is the person depicted by the statue? 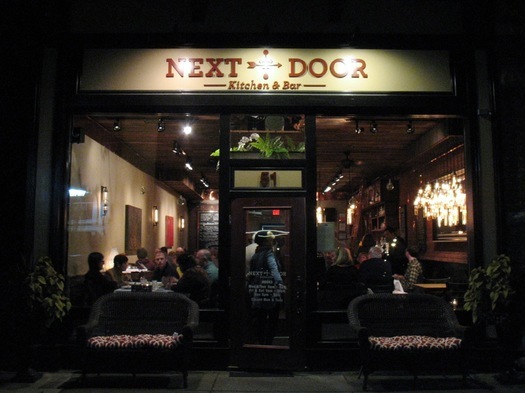 Next Door Kitchen & Bar: Cozy space. Nice food. Friendly staff. Fair prices. Return happily. Boiling down the thought was kind of fun, so we figured we'd write a handful of other no-more-than-10-word reviews/comments on places around the Capital Region. And maybe you can share one or two that occur to you. 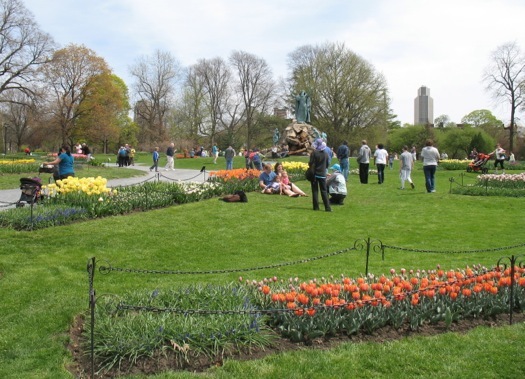 Tulip season is very much underway in the flowers beds of Albany's Washington Park. There are still several varieties yet to bloom, but there were plenty of tulips to gawk at Wednesday afternoon. So who's out to the early lead in this ultra-competitive floral venue? Which blooms are lowering the boom on the competition? The peanut butter egg is a seasonal item, and therefore only available part of the year. So even if somehow the egg and the cup were both of the same quality (which they are obviously not), because the egg is more scarce than the cup, it will be more desirable to us. Sure, this part of it is all in our heads, but so much of life is. Just last night we had a peanut butter egg -- and we can confirm it is still better. Earlier this week, Gawker posted a list of neighborhoods that were supposedly "the Williamsburg" of their respective cities. 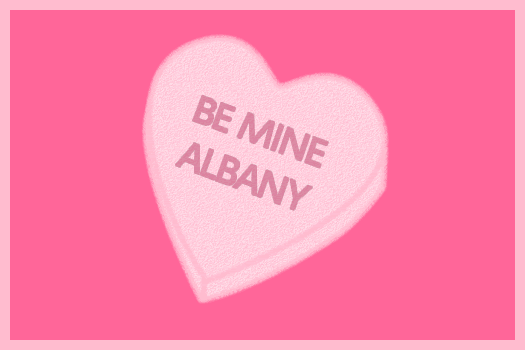 A lot of people floated the link our way because Albany is mentioned -- and Center Square is tagged as "the Williamsburg." That seemed... not correct. But, whatever, the whole idea is silly. So, of course, we then proceeded to make a list of Capital Region neighborhoods/places and their NYC neighborhood (or near NYC) analogs. No mystery: Veronica Mars was a really good show. Snowshoeing, skiing, pond skating -- all fun things to do during the winter, and good ways to get out of the house. 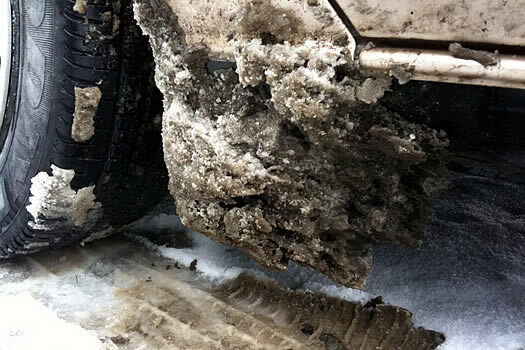 But you know what: Sometimes in the deepest part of winter you just want to stay inside, wrapped up in a blanket on the couch, and hibernate. Preferably with some good TV to watch. We would argue the best hibernation TV is made up of series that can be block (or binge) watched. So here are a handful of our suggestions. It's just a few shows, so we're hoping that you'll add some of your favorites in the comments. One of your faves could be totally new to someone else -- and become a new favorite for them. As you well know, the key to staying warm in very cold weather is layering. 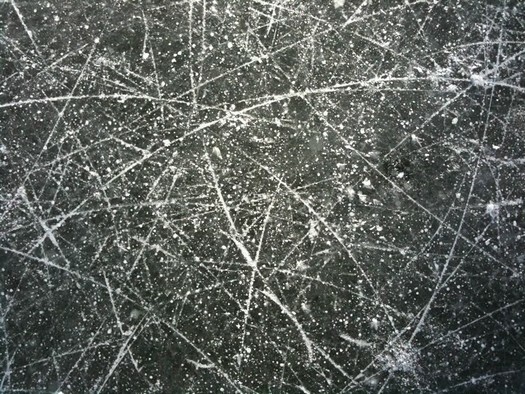 But in these cold, competitive times are you willing to stand idly by while your co-workers or neighbors out layer you? No, you are not. 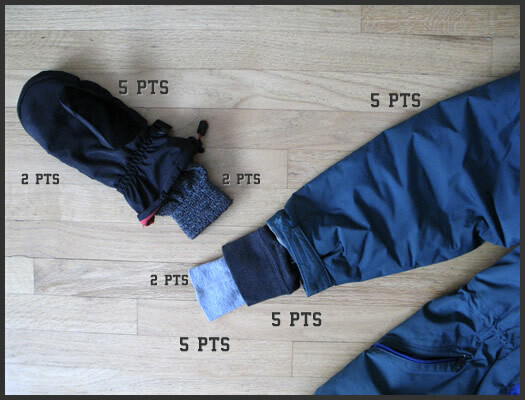 To that end, here is a competitive layering metric to help you accurately score the way you've deployed your winter clothing. 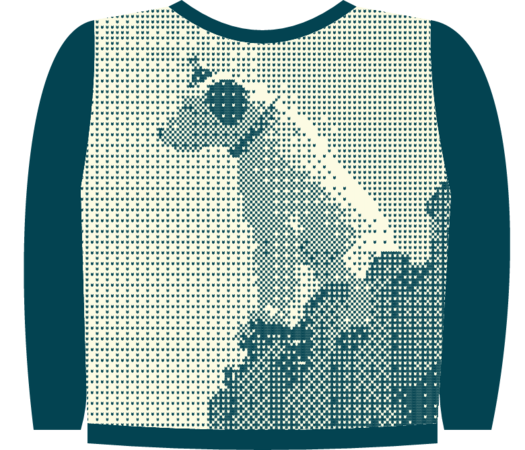 A high score will definitively prove you have out layered the crowd. And that you're warm. Can the Sansa be a contender? A popular pick. 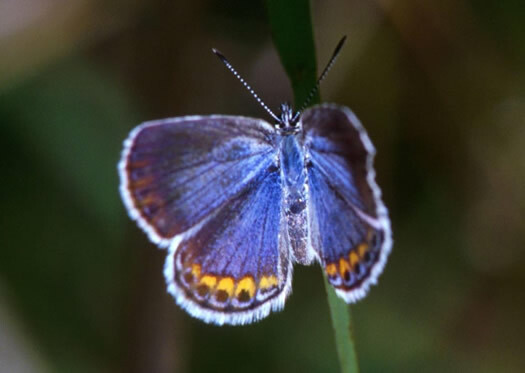 And its ability to grow in colder climes is admirable. But some real talk: Honeycrisps are sweet and little else. They lack complexity. It's like they're just a bit too eager for you to like them. And have you seen the gargantuan size of some of the apples in stores lately? Too much. Let the masses eat Honeycrisps -- you can do better. Two quarts of this year's haul. 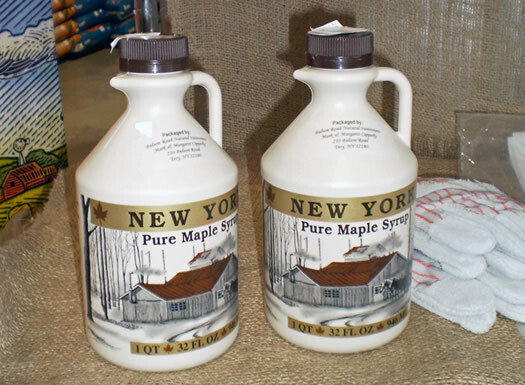 Agricultural fact of the day: New York State produced 574,000 gallons of maple syrup during the 2013 season, according to a recently-released USDA report. Production in New York -- and all around the nation -- was way up this year compared to 2012 because of that year's oddly warm spring. 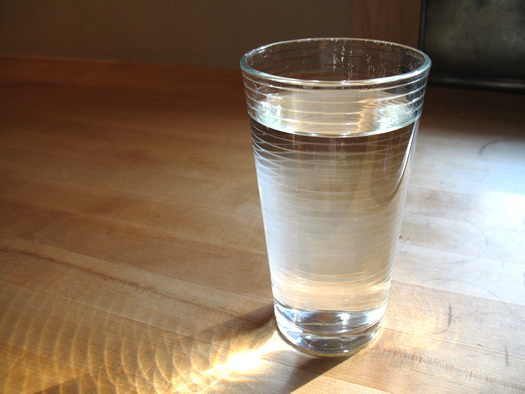 The weather last year significantly shortened the amount of time farmers could gather sap -- just 24 days on average. This year the average season was 37 days. 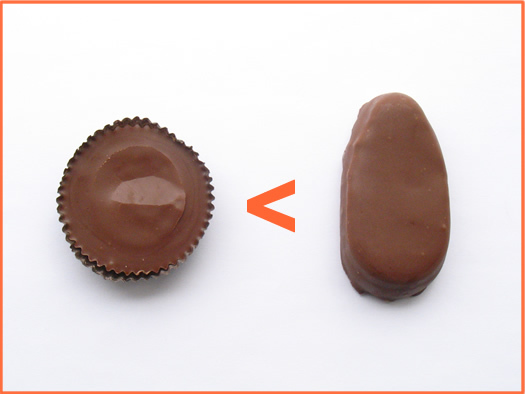 Friday morning on AOA's Facebook page we blithely asserted that the Reese's peanut butter egg is vastly superior to the peanut butter cup. And while there were some who agreed with us, we did later in the day realize the error of our ways. We didn't have data to support our claim. So, because it's Friday afternoon, here is definitive proof that the peanut butter egg is better than the peanut butter cup. Because it's Friday at 4:30 pm: here are 12 seconds of a baby goat trying to climb up onto a couch at a recent Modern Farmer photo shoot. The kid is from Skipping Goat Farm in Westerlo. Modern Farmer is a new publication based in Hudson. It's releasing its first issue in April. For Valentine's Day we thought we'd whip up something fluffy: a little infographic of local bits related to holiday, love, and attraction. Among the bits: the number of single people, the price of roses, Ferris Wheels, engagement rings, and... Craigslist. The arrival of the Watson system will enable new leading-edge research at Rensselaer, and afford faculty and students an opportunity to find new uses for Watson and deepen the systems' cognitive capabilities. The firsthand experience of working on the system will also better position Rensselaer students as future leaders in the areas of Big Data, analytics, and cognitive computing. 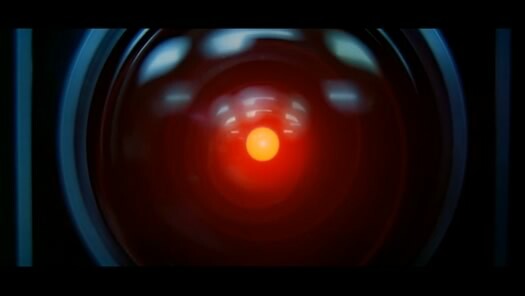 This is a big deal because systems like Watson -- along with other stuff like Siri, and Wolfram Alpha -- are both the future and The Future (you have to say it while looking off into the distance). They hold the promise of helping people make sense of the torrents of data all around us. Now, via a flashforward, a future timeline of Watson at RPI. Believe it or not, there are some people who don't visit AOA via an autocomplete url, feed reader, share, irresistible urge, or unconscious habit. (Yes, shocking, we know.) Many of these people come in looking for something via Google -- and sometimes we can't help but take notice of what they're looking for. 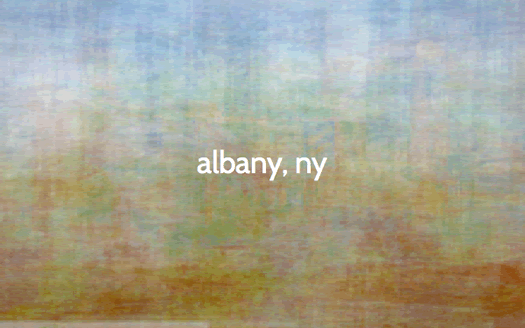 And then Albany Archives created the image on the right. Sometimes you just need a hipster portrait of a famous explorer to get you through the day. 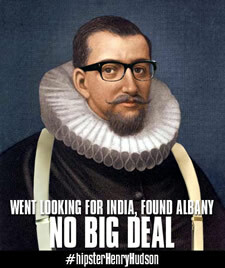 Roll your own: AA has posted a blank version of the hipster Henry Hudson image if you'd like to your own Hipster Hudson quote. And here's one by @Bullmooser12. This Washington Ave, it extends. 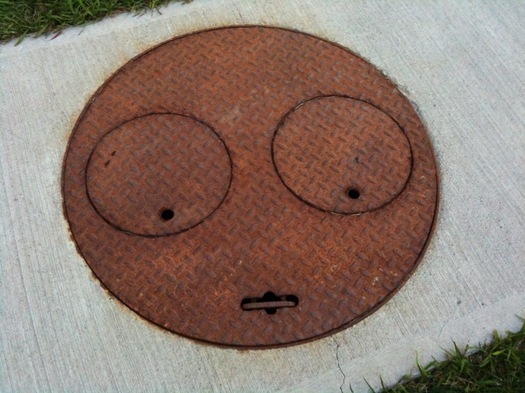 Because it's Friday: We came across this manhole cover on the Harriman State Office Campus recently while walking Otto. A rare time out from the intensity of the race for (left to right) "Gary McCarthy," "Lou Rosamilia," and "Jerry Jennings." While many politicians are just gearing up for the fall elections, some Capital Region politicians have been at it since the beginning of summer. 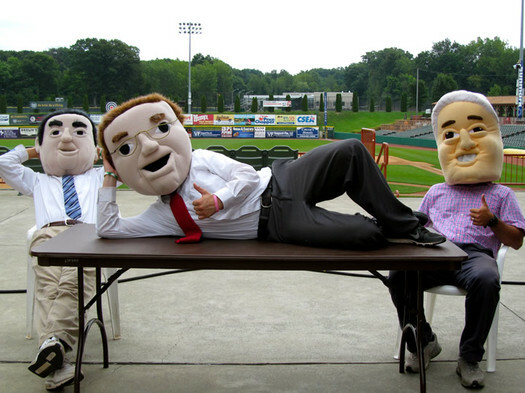 The nightly mayors race at the Tri-City ValleyCats games have kept Albany mayor "Jerry Jennings," Troy mayor "Lou Rosamilia," and Schenectady mayor "Gary McCarthy" in peak political shape. 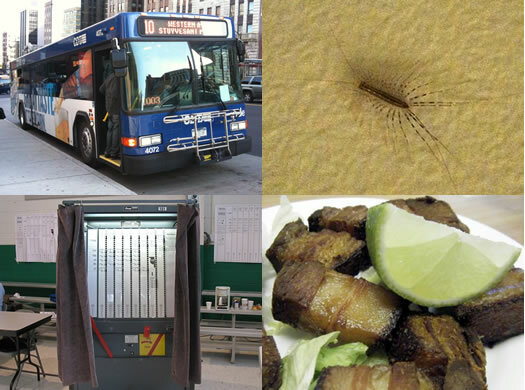 What would you call a New York State without New York? 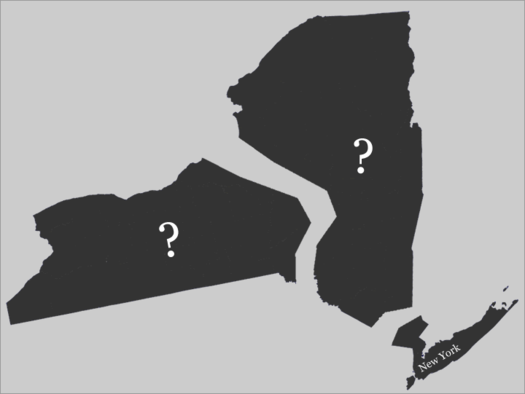 Today's (more than) somewhat ridiculous question: If New York City and the rest of the state divorced, what would you call the rest of the state? This question came up during a conversation recently (obviously a very serious discussion). 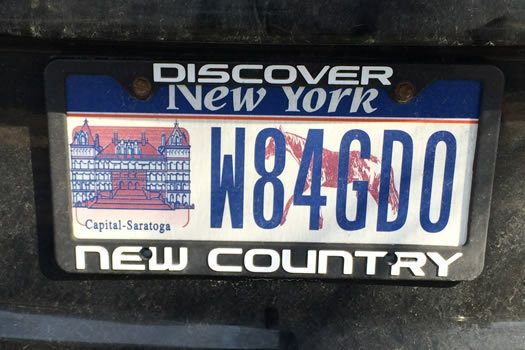 It was quickly decided that New York City would retain the name New York State. 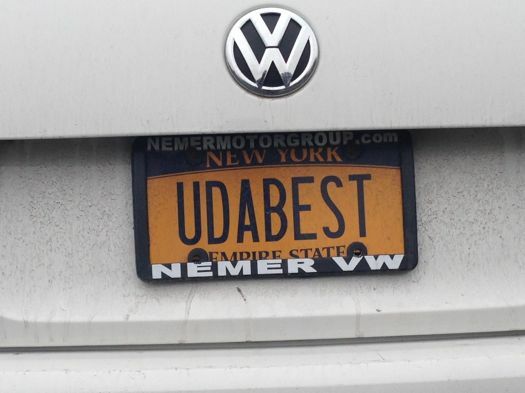 But what about parts upstate? Yes, all very important questions. Believe it or not, there are some people who don't visit AOA via a bookmark, feed reader, irresistible urge, or unconscious habit. (Yes, shocking, we know.) Many of these people come in looking for something via Google -- and sometimes we can't help but take notice of what they're looking for. Tulips are past their prime? Still wish you could enjoy the blooms now? There's an app for that. Introducing TulipVision, the world's first augmented reality app for tulips. 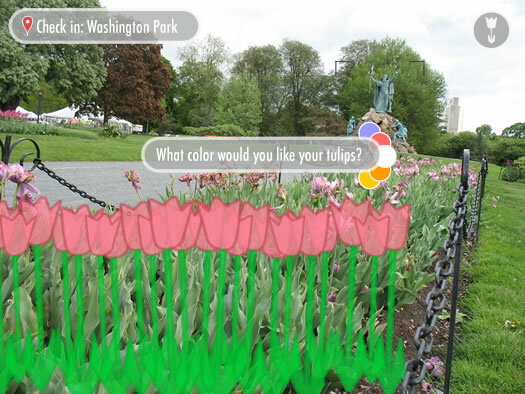 Using an iPhone, iPad, or Google Glasses, TulipVision inserts digital tulips into your field of vision in the spaces occupied by empty flower beds. This is just version 1.0 -- future versions are planned to include a number of TulipFest-related features. 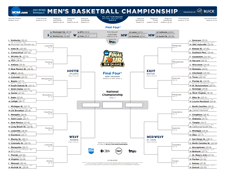 We figured it'd be fun to set up an NCAA tournament pool for AOA people. So we did. If you already have a bracket set up at Yahoo, you should be able to add it to the AOA pool with just a few clicks. To make things (only somewhat) more interesting, we'll give the winner of the pool a $25 gift certificate to the Recovery Room. The deadline to set your bracket is 12:15 pm on Thursday. (The new "first four games" -- or whatever they're called -- aren't included. Thankfully.) Good luck. 'Cuse: Syracuse is the #1 seed in the East bracket. The Orange play UNC-Asheville Thursday at 3:10 pm. The game will be on TruTV. You can also watch it online. Using only scissors and a glue stick, we've made a new batch of AOA valentines for this year's Valentine's Day. That's one of them on the right. A full size version, plus a few more (including one returning from last year), are after the jump. Please feel free to copy/email/facebook/tweet/pinterest as you like. Can you guess Capital Region cities or towns by their geographic shape? A handful are after the jump. There are many things in that bucket. Hope is not one of them. You might have seen one or two stories about the The Place Beyond the Pines shooting around Schenectady, and sightings of the film's star, Ryan Gosling. There's a site called the "The Color Of," which pulls photos from Flickr and combines them to determine the "color" of something. So we plugged in "albany, ny." It kind of has a nice impressionistic vibe going for it. And if you lean back, you can sort of see what looks like the ESP. 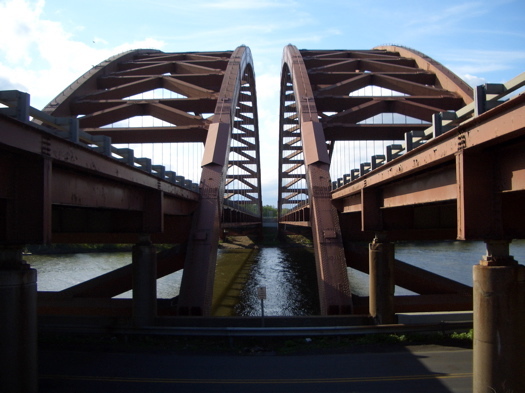 Including a geography question involving the Twin Bridges. Veronica would have cracked this yearbook case, no problem -- all while solving Lilly Kane's murder. We joked this morning that the Saratoga High School yearbook story would have been better as a Veronica Mars episode.